Crown Prince Mohammed bin Salman is the most promising monarch to have taken over important reigns in Saudi Arabia. This is based on his modernist tendencies and his desire to transform this kingdom and reshape society. Hence, the nations of China, India, and Pakistan respectively have all welcomed the Crown Prince with open arms. Certain politicians in America, not President Donald Trump, have spoken unprofessionally toward the Crown Prince based on the Jamal Khashoggi affair. Yet, for powerful nations including China, Japan, India, and the Russian Federation; then the Crown Prince is viewed to be part of a new vibrant Saudi Arabia that is in the making based on his visions. 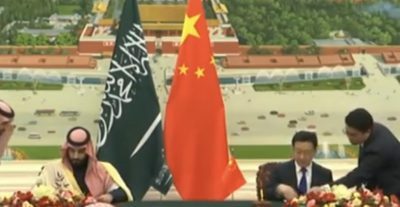 China and Saudi Arabia seek to shape an already potent relationship to a higher degree based on both nations having strong visions for the future. This applies to Saudi Arabia and Vision 2030 along with China’s grand designs based on the Belt and Road Initiative. Therefore, with Saudi Arabia impacting more greatly internally in the affairs of Pakistan and the kingdom’s influence carrying enormous weight based on economic and religious factors; then this geopolitical importance will further the ambitions of China based on many overlapping themes. Of course, the visit of the Crown Prince to India and Pakistan was overshadowed in the news by recent terrorist events in Kashmir. This, in turn, led to increased tensions between India and Pakistan. Hence, the Crown Prince focused on diplomacy and economic areas – while condemning terrorism. However, irrespective of events in Kashmir, the trip to India and Pakistan respectively was a success and it highlights the esteem that both nations have toward the Crown Prince and Saudi Arabia in general. Overall, the Crown Prince is planned to visit other nations in Asia where he will equally hope to cement ties to a higher level. This sums up a parallel world where some Western nations have behaved shamelessly toward the Crown Prince. However, in truth, Saudi Arabia is too important to be cowed and the Crown Prince understands the need to modernize many areas of the kingdom.